Represents the interests of pharmacists employed or interested in careers in non-patient facing roles in the life sciences industry in Ireland. PIER membership is open to all pharmacists who have undertaken a pharmacy degree and are eligible to be listed on the Register of the Pharmaceutical Society of Ireland. Activities include engaging with Irish Institute of Pharmacy (IIOP) regarding the CPD ePortfolio, organising CPD and networking events for members, and supporting and encouraging more pharmacy students & pharmacists to consider a career in the life sciences industry. 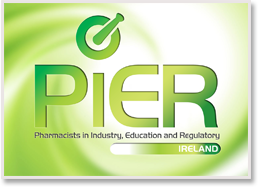 PIER (Pharmacists in Industry Education and Regulatory) represents the interests of pharmacists employed or interested in careers in non-patient facing roles in the life sciences industry in Ireland. PIER was formally established in November 2012. Membership is open to anyone who has undertaken a pharmacy degree (in Ireland or other countries) and is eligible to be listed on the Register of the Pharmaceutical Society of Ireland. PIER is a member of the European Industry Pharmacist Group (EIPG) which represents the national, professional organizations of pharmacists employed in the pharmaceutical or allied industries across Europe. PIER is an entirely voluntary organisation, supported by a committee elected from within the membership. Active membership currently stands at 160 full members working in diverse roles across academia, industry & regulatory and 100 student members (intern & postgraduate) interested in a career in the life sciences industry. If you are interested in becoming a member of PIER, please visit the membership page. If you are interested in being kept updated of PIER's activities, please contact membership@pier.ie to be added to the mailing list.